The congratulations came from an unlikely source—the grandmother of this child, the mother of the sweet birth mother who chose adoption for her baby girl. To say I was overwhelmed is an understatement. Thankfulness filled my heart—to God who’d answered my prayers and to the birth mom who’d chosen our family for her daughter. I also ached that my joy would be another’s heartache. Working with teen moms for ten years, I was often an advocate for the young mother. I knew that while the weeks and months ahead would be a time of celebration for our family, they would be ones of heartache and grieving for this woman. Adoption is a wonder and the beauty, and the sacrifice of it is never so clear as on Mother’s Day. We’ve adopted three children, and they are a huge part of my heart. Their lives are a gift to my days and their smiles can make even the most dreary afternoon bright. I can honestly say there is no difference in the love I feel between my adopted children and my three other children. The sacrifice of adoption makes my heart ache, for I know on this Mother’s Day another woman will be thinking about my daughter—her daughter. As I rejoice, I’ll be crying tears for her. I’ll also be sending up prayers that God will wrap His arms around her in a special way. This Mother’s Day, I cannot help to think about Christ’s sacrifice to make our adoption into God’s family possible. Maybe it’s because just a few weeks ago we were celebrating Easter, but I’m reminded anew that my gain required His loss, His pain. The greatest love, it seems, is not shown with flowers, chocolate or a diamond bracelet. The greatest love is shown when, because of your love for another, your desires and comforts are laid down for the greater good of someone else. As Ephesians 1:3 says, “How blessed is God! And what a blessing he is! He’s the Father of our Master, Jesus Christ, and takes us to the high places of blessing in him. Long before he laid down earth’s foundations, he had us in mind, had settled on us as the focus of his love, to be made whole and holy by his love. Long, long ago he decided to adopt us into his family through Jesus Christ. (What pleasure he took in planning this!) He wanted us to enter into the celebration of his lavish gift-giving by the hand of his beloved Son” (The Message). 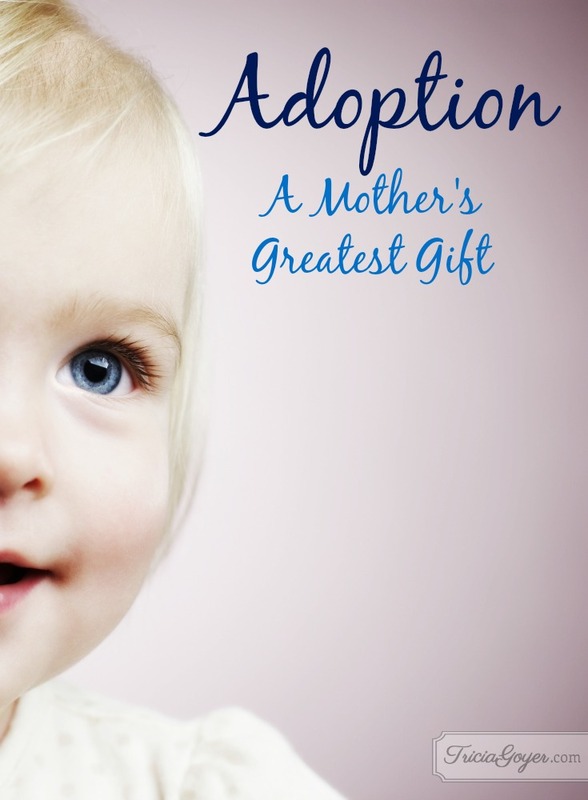 Perhaps you know an adoptive mother. Take time this Mother’s Day to let her know that the beauty of her gift is not missed by you. Also, take time to thank God for adopting you into His forever family, thanking Jesus Christ for His sacrifice. I wouldn’t be the mother I am without this Gift of Love. Beautiful post Tricia. Happy Mothers Day. Your story sent chills up my arm because we share that same miracle. We have 3 adopted (2 international and 1 local) and 1 biological. I like to say – I’ve been in labor and I’ve been to the airport. The airport was easier but all my kiddos are special blessings. Thanks for the beautiful piece. Agree that we must pray for those birth mothers who sacrificed for us. What a gift! Stunningly beautiful, Tricia. I love this article and hope you have a wonderful Mother’s Day.